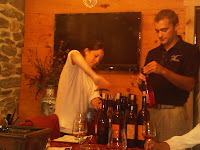 Yesterday I escaped the suburbs for a taste of wine in Loudoun wine country by visiting Sunset Hills Vineyard. I had intended to sample some wine along with our friend, Jim Corcoran from neighboring Corcoran Vineyards, but instead participated in a wine tasting class hosted by Sunset Hill's winemaker, Nate Walsh. 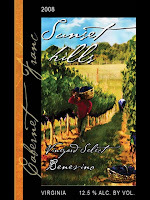 Sunset Hills is now known for their fabulous Viognier, but this class was an introduction to their Cabernet Franc offers through a vertical and horizontal tasting. Mr. Walsh lead us through five cabernet franc wines, some styles within the same year (horizontal) and others from differing years (vertical). He first explained why Cabernet Franc is well suited for the Virginia climate. First, the grape seems to thrive in the clay soils. Second, the grape ripens early and is thus relatively unaffected by late season rain. Yes, Virginia can receive abundant late summer or early fall rain thanks to hurricanes or tropical storms moving north. Since the grape ripens early, this excess rain will not result in the plant generating more juice, thus diluting the overall concentration. And finally, Cabernet Franc grows in loose clusters, which enables air to move between the individual grapes - reducing chances of mold or rot that normally would result from the regions high summer humidity. Now for the wines. We started with a dry rose, which actually contains a hint of sweetness from not allowing all the grape's sugar to ferment. However this sweetness is nicely balanced with an acidic finish - a nice summer wine. We then sampled a vertical tasting from grapes harvested from Benevino Vineyards. This estate lies higher in elevation and with more limestone soils, thus producing a different flavor composition from Sunset Hill's estate grown Cabernet Franc. The 2008 was made in a lighter style whereas the 2009 was given extended maturation which means after fermenting the juice sat with the skins and seeds for a few additional weeks. The result of yearly differences and this winemaking technique is a fuller wine. Even though this wine will remain in the barrel for another year, I liked it a lot more than the 2008. We tasted the last two wines out of order - accidents happen - starting with the 2007 Reserve Cabernet Franc. It is well known the 2007 was an incredible growing season in Virginia, and this wine reflects the year. The winery also reduced yields, resulting in even more concentrated fruit. The result is an outstanding wine - full bodied, tannins suitable for aging - but not overpowering. Today may have been the last time tasting this one - supplies are very limited. We then retreated to the 2008 Cabernet Franc which wasn't bad; but after the '07, any comparison would be unfair. But it was a nice exercise in the difference that a single year can make. While not as full bodied, it has more pepper and spices than the preceding year and less tannins. Overall, not a bad wine. After the class I did get a chance to share a bottle of the 2007 Reserve Cabernet Franc with Jim and a couple new friends. With Patty Reese playing in the background it was the best possible example why its worthy to drive an hour into the country: good wine, music, and friends.